Have you noticed that there are many weeds out early and in abundance this year? Since the weather warmed up so early this year, it left the opportunity for weeds to move in fast before the grasses and other plants get their usual head start on them. In addition, many of us have not had the chance to treat the lawn and beds with pre-emergents. We have several options to help with your weed control efforts. You may want to use several methods to combat weeds at your home. You can still use pre-emergents in your lawn and flowerbeds. We have several products for pre-emergent control in the lawn, including HI-Yield Herbicide Granules and Natural Guard Corn Gluten Lawn Food. Preen is a good pre-emergent product for flowerbeds. We also have options available including products with fertilizers to feed the existing plants. Pre-emergents keep seeds from germinating and will keep new weeds from starting. Which is good, but they will not kill weeds that are already rooted. For weeds that are already growing, you will need to use a weed killer, Round-Up or pull or dig them up. Be sure to read labels and ask for advice before you use weed killers. Some will kill everything, and some are specific to certain types of weeds and do not kill the grass. It may be best when the weeds are around your desired plants to pull, dig or hoe them out. Fertilome Over-The-Top is a product for grass in the flowerbeds. It will kill grasses, but not flowers. For weeds currently in the lawn you can apply Fertilome Weed-Out plus lawn fertilizer (the second step of the Fertilome 4-step lawn program). The grass should be damp when you apply since the product needs to stick to the weeds to kill them. There are also many good spray or spot weed killer products available. Our staff can help you with the product that is right for your situation. If you prefer your independence, product labels will have the weeds listed that the product is designed to kill. If you use pre-emergent and weed killer products at the same time, be sure that only one of them contains fertilizer and that you don’t double up on fertilizer. Too much fertilizer can burn grass or plants. Weed and grass killers such as Round-Up will kill most every thing they come in contact with. They should only be used in areas where they cannot come in contact with desired plants and grasses. They are best for weeds in the driveway, sidewalk or patio. 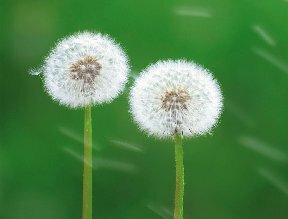 Avoid using them on windy days that could result in overspray into a nearby lawn or flowerbed. Always be sure to read and follow the directions on the labels carefully for the safety of you and your plants. Also, check the labels before starting new seed in treated areas. All weed control products will list the amount of time they recommend to wait before starting new seed. We have staff on hand who can help with weed control and other plant questions. Come by and see how we can help you.